Lung cancer arises when a series of mutations in normal lung cells cause them to become abnormal and grow out of control. These changes can take place anywhere from the bronchus (the windpipe), down to the small air sacs in the periphery of the lungs (the alveoli) where oxygen exchange takes place. It's important to note that lung cancer is a multifactorial. This means that it is often caused (or in contrast prevented) due to a combination of several factors. Once uncommon, the surge in smoking of the 20th century, along with other factors, has contributed to a tremendous rise in the incidence of lung cancer. Lung cancer is now the leading cause of cancer deaths in both men and women in the United States. On the bright side, with widespread awareness of the risks of smoking, and the awareness that we need to address the causes of lung cancer in addition to smoking, many hope these numbers will decrease in the future. At the present time, the incidence of lung cancer in men appears to be decreasing while that in women appears to be leveling off. Of concern is that lung cancer in young adults, especially young, never smoking women is increasing. The reason for this is not known. It comes as a surpise to many people, but lung cancer is now diagnosed more frequently in people who do not smoke than those who smoke. The majority of people who are diagnosed with lung cancer today are either former smokers or never smokers. While former smokers are at the greatest risk, it's important to note that lung cancer in never smokers in now the 6th leading cause of cancer related deaths in the United States. Tobacco use is responsible for almost 80 to 90 percent of lung cancer cases. That being said, those who have never smoked or quit long ago, may develop lung cancer as well. The most common cause of lung cancer in non-smokers (and the second most common cause in people who smoke) is exposure to radon in the home. Radon-induced lung cancer is responsible for around 27,000 cancer deaths each year, a large number considering there are around 40,000 deaths from breast cancer each year. Elevated radon levels have been found in homes in all 50 states and around the world, and since exposure is in the home, the risk is likely greatest for women and children. Thankfully, a simple test can tell you whether your home is safe or not, and radon mitigation, if needed, is almost always successful in getting rid of the problem. Workplace exposures are also an important but little spoken of cause of lung cancer, with up to 27 percent of lung cancers in men considered to have an occupational exposure component. Many people have heard of asbestos, yet there are many chemicals and other exposures which can place people at risk. Other environmental pollutants and secondhand smoke are also important causes. Lung cancer most commonly presents with a cough that does not go away over time. Sometimes it shows up with vague symptoms, such as fatigue, and about 25 percent of the time, there are no symptoms at all. Since lung cancer is common, anyone, especially those who smoke, should seek prompt medical attention for any symptom that is new or unexplained. At the current time, the average amount of time between when a person notes symptoms and when they are diagnosed is 12 months. 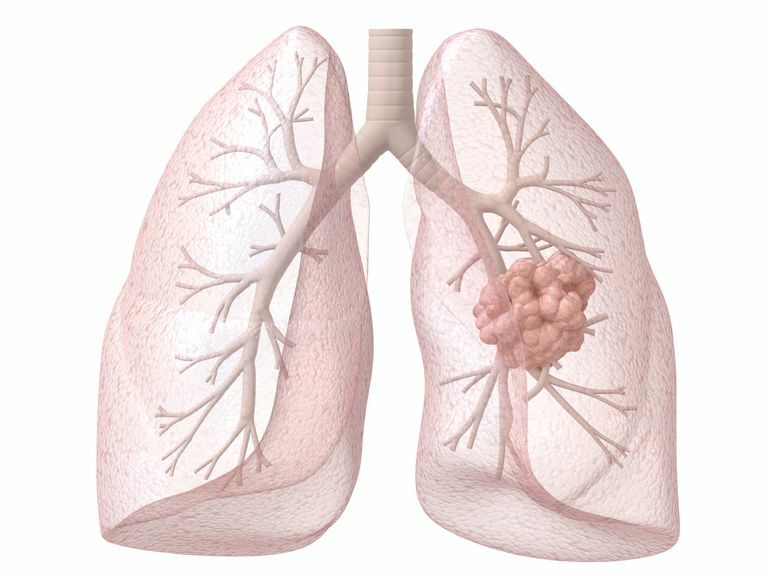 It's likely that prompt attention to symptoms could result in diagnosing lung cancer at earlier, more treatable stages. Lung cancer is often suspected initially from a chest x-ray done to evaluate a cough or chest pain. Further studies are performed to determine if the abnormality is benign (non-cancerous), or malignant (cancerous.) If these show cancer, further tests may be performed to see whether the cancer has spread (metastasized) to other areas in the body. There are two major types of lung cancer. Non-small cell lung cancer accounts for roughly 80 percent of cases. Small cell lung cancer, the type of lung cancer more closely associated with smoking, comprises 15 percent of lung cancers and tends to spread quickly. Rare forms of lung cancer include carcinoid tumors and mesothelioma. Non-small cell cancer is divided into stages from 1 to 4 depending on how far the cancer has spread. Stage 1 is localized. Stage 2 has spread locally, often to a lymph node. Stage 3A and Stage 3B involves further spread locally but beyond the lung. Stage 4 indicates spread to another region of the body. Small cell cancer is separated into two stages based on whether the cancer is limited or extensive. Depending upon the stage and type of lung cancer diagnosed, treatment may include surgery, chemotherapy, and/or radiation therapy. New treatments, such as targeted therapies and immunotherapy are becoming available that target changes more specific to lung cancer - and consequently often have fewer side effects than traditional therapies. Caught early when it can be treated with surgery, lung cancer can be very curable. Sadly, the majority of people with lung cancer are diagnosed after the cancer has spread too far to do surgery. Even in this case (inoperable lung cancer,) treatment can increase the length of survival, and sometimes result in long-term cancer-free remission. Since people vary widely in their general health at the time of diagnosis, it can be discouraging and misleading to look at statistics. Your health care provider is a better source for looking at your individual situation. As a word of caution before reading statistics, keep in mind that lung cancer treatment is improving and survival rates are improving. Statistics tell us how someone did with lung cancer in the past - not how you will do with lung cancer today. As a case in point, many of our statistics are several years old. Between 2011 and 2015 there were more new treatments approved for the treatment of lung cancer than there were in the 40 year period preceding 2011. Unlike some cancers, we don't have a screening test for lung cancer which is effective in detecting lung cancer early in everyone. Yet we have learned that, for people who meet current criteria, screening CT scan may detect lung cancer earlier than if we waited for poeple to develop symptoms. It's thought that if everyone who was a candidate for screening were screened, the mortality rate for lung cancer could be reduced by 20 percent in the United States. There is much more support for people with lung cancer than in the past. There is a very active lung cancer community which is helpful for those diagnosed not only as a source of support but in helping people navigate their way through the mound of information you need to digest when you are diagnosed. If your loved one has been recently diagnosed with lung cancer, you are probably overwhelmed and anxious as well. In addition to having to cope with your loved one being diagnosed, there is a feeling of helplessness. Thankfully, many of the lung cancer support communities now have support groups (online and in person) for family caregivers of those diagnosed with lung cancer. Check out these tips for when a loved one has lung cancer.